Christian Feast... or Pagan Festivity? Rob Tillett looks at the history and meaning of Candlemas (February 2) and how it ties in with the ancient pagan festival of Imbolc, or Oimelc, celebrating the cross-quarter day marking the beginning of spring. This day is also linked with the worship of Brigid, the primeval goddess, marked in the modern age by St Bride's Day, February 1. In the Christian Calendar, February 2 marks the presentation of the baby Jesus to the Temple, 40 days after the festival of his birth. This is Candlemas, a major Christian Feast, one of the "cross-quarter days", marking the mid-point between the solstice (Christmas) and the equinox (Easter). The other cross-quarter days are Walpurgis Night (April 30) followed by May Day (May 1), Lammas (August 1) and Halloween (Oct. 31) followed by All Saints Day (Nov. 1). Though Candlemas is observed on February 2nd in the Western churches it is celebrated on February 14-15th in the Eastern churches, due to the difference in the liturgical calendar. 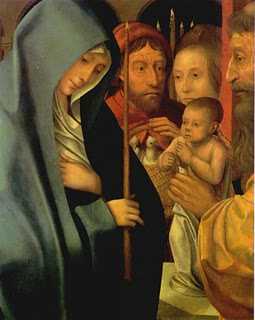 Its formal name is either the festival of the Purification of the Virgin, or the Presentation of Jesus in the Temple. In the Orthodox Church it is known as the Feast of the Presentation of our Lord and Saviour in the Temple. In the West, the date of Christmas has long been fixed at December 25, and Candlemas therefore falls on the following February 2. The dating pattern is identical among Eastern Orthodox Christians, except that the ecclesiastic December 25th of most Orthodox Christians falls on January 6th of the civil calendar. Before December 25 (Dies Natalis Solis Invicti—the Birth of the Invincible Sun) was selected by the Roman Church as the official date of the Birth of Jesus, his nativity was celebrated on January 6th (now Epiphany).The difference in dating between the two great branches of the faith is due to a theological dispute related to the adoption of the Gregorian calendar, meaning that most Orthodox Christians celebrate the feast (i.e. Candlemas) on February 14th, or February 15th. Imbolc, or Oimelc is one of the eight solar holidays or sabbats of Neopaganism. Originally it was a pre-christian festival celebrated on the eve of 1 February, because in ancient times, days began in the evening of the night before, hence the profusion of "Eves", like Christmas Eve, New Year's Eve, Halloween, etc. The name, in the Irish language, means "in the belly" (i mbolg), referring to the pregnancy of ewes, and is also a Celtic term for spring. Another name is Oimelc, meaning "ewe's milk"; also Brigantia, referring to Bridget (Brigid), the Celtic goddess of knowledge and smithcraft, to whom the day is sacred. [More on Brigid.] A fire goddess, she was tended by 19 vestal priestesses (for the Celtic Great year—it takes 19 years for the new moon to coincide with the Sun's winter solstice) and her shrines were to be found in sacred wells, oaken groves, caves and high places, such as the Bridestones in Cheshire, and the High Bridestones in North Yorkshire. Her worship is still celebrated on St. Bride's Day (Bridget's Day), February 1, as, unable to subdue her cult, the Church created a saint, St Bride (or St Bridget), as a way of harnessing the power of the goddess and harmonizing her worship with the Christian teachings. Her ancient shrine at Kildare—where now stands St Brigid's Cathedral—is said to have housed a sacred, perpetual fire. Modern usage has also allowed the festivity to be called Brigid, but that is the name of the goddess, rather than the name of the day. Today modern pagans either celebrate Imbolc on the 1st or 2nd, the 2nd being more popular in America, perhaps because of a confusion with Candlemas and the popularity of Groundhog day. 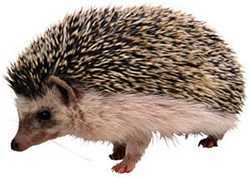 In some countries it was believed that a type of burrowing animal—a hedgehog was popular—would come out on Bridget's Day to judge the quality of the weather. This tradition came with settlers to the New World, but alas no hedgehogs could be found, just groundhogs—in abundance. Thus Groundhog Day was born. 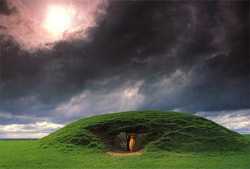 That Imbolc was an important time to the ancient inhabitants of Ireland can be seen at the Mound of the Hostages in Tara, Ireland. Here, the inner chamber is perfecty aligned with the rising sun of both Imbolc and Samhain. Neil Giles has written an excellent article on this site, Celtic Fire Festivals, which will place these ancient festivals, including Oimelc (Imbolc), or Candlemas, in a well-rounded context. The holiday is a festival of light, reflecting the lengthening of the day and the hope of spring. It is traditional to light all the lamps of the house for a few minutes on Imbolc, and rituals often involve a great deal of candles. One version of a modern celebration of Imbolc is presented here, at the Druid Grove. The Catholic Encyclopedia denies any association of Candlemas with Imbolc, or any other pagan festival, such as the Lupercalia, but many writers hold that the Christian festivity is a refocusing of the older celebration. Mike Nichols has a more explicitly pagan view of this festivity, so check out his article Imbolc. Maria K. Simms: Candlemas Lore, Starcraft online resource.